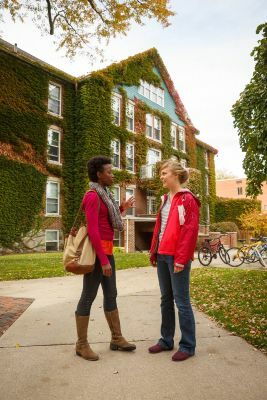 What are the on-campus living requirements? All full-time students enrolled at GC must live in campus housing unless they have 112 credit hours, turn 23 years of age in a given semester or live with parents or an immediate family member. Full restitution of room and board fees will be expected if students bypass the residency requirements. May first-year students have cars on campus? Yes. All students must register any and all vehicles they bring to campus. There is no fee for registering your vehicle. Registration should be done prior to the first day of class and can be done online. Do national fraternities and sororities exist here? No, not at Goshen College. Goshen College has clubs established by students through our Student Life division. See our full listing of clubs, co-curriculars and intramurals. What is spiritual life like on campus? Goshen College’s Christian mission has permeated our academic and community ideals since the college was established in 1894. Goshen College is rooted in the Anabaptist-Mennonite faith tradition; Mennonite Church USA is one of the historic peace churches. For more information see Campus Ministries and learn more about our “Culture for Service” and core values. We believe, as early faith leader Menno Simons said in 1539, that “true evangelical faith cannot lie dormant.” We follow the example of Christ, serving others with energy, sensitivity, skill, integrity and compassion. We want to help you merge your mission with God’s mission on earth, investing your energy in meeting the needs of a changing world. It’s what Goshen calls “Culture for Service” – using your knowledge and your talents to help others. Expect to be stretched as you learn about the resources and values of Goshen College and are encouraged to articulate your own values. You’ll wrestle with such questions as how leaders and known figures compose their lives; whether religious or ethnic background, as well as beliefs, can influence one’s career path; the many forms service and worship can take; and whether we choose our disciplines or careers – or whether they choose us. In addition, there are many significant ways to explore your Christian spiritual life at Goshen College. Goshen College has a campus pastor, Bob Yoder, as well as a Catholic Student Association adviser. You can get involved with the Campus Ministries team and spiritual life through their many organized activities. Goshen College has partnered with the local Goshen Family Physicians to serve as the primary medical service provider for students and for such program-related services as Study-Service Term immunizations and athletic physicals. Counseling services continue to be offered on campus. Goshen General Hospital is across the street from campus and can provide emergency care. Is there a job placement or career day? Goshen College, as part of its mission, wants to help students find not just a job, but to understand how their gifts may turn into a calling. We want to help you merge your mission with God’s mission on earth, investing your energy in meeting the needs of a changing world. Goshen College helps students market their skills, abilities and strengths in order to find employment through the Career Networks office. Does the college offer an intramural program and if so, what are the most popular sports? Yes, the college has a popular intramural program. Popular sports include basketball, volleyball and sand volleyball, Ultimate Frisbee, racquetball, badminton, indoor and outdoor soccer, floor hockey and table tennis. The Roman Gingerich Recreation-Fitness Center (RFC) offers state-of-the-art facilities: three full-size basketball and multipurpose courts; 200-meter running track; 2,800-square-foot weight room; four racquetball courts and a large training room and Exercise Science lab. Learn more about the RFC or visit the intramurals website.